With the January transfer window just a few days away manager Mark Wright has outlined his plans for strengthening the current squad. City will entertain Crewe Alexandra in the semi-final of the competition on Tuesday 20 January at Deva Stadium, kick-off 19:00hrs. The date for the other semi between Macclesfield Town and Tranmere Rovers is still to be set. City’s year ended in defeat as Mark Wright’s team were beaten 3-1 in the Cheshire derby at Macclesfield Town on Sunday. Despite conceding a goal as early as the sixth minute the Blues fought back to equalise after the break through the in-form Ryan Lowe. With the score poised at 1-1, the game hinged on a controversial decision to award the home side an penalty after Shaun Kelly was adjudged to have handled a ball in the area in the 76th minute. Gareth Evans sent John Danby the wrong way from the spot-kick and the game was wrapped up later by Martin Gritton. Two goals from Ryan Lowe either side of the break gave City their first Boxing Day victory for five years. The Christmas period hasn’t been a happy time for the Blues in recent years with the last Boxing Day win coming over a beleaguered Leigh RMI side when City were scoring for fun, putting five past the Lancashire side. City were forced into one change from the side that drew at Bradford City with defender Shaun Kelly taking a place in the bench after picking up a hamstring strain, Richie Partridge took his place in the starting line-up. Persistent work from Kevin Ellison set up the opening goal as he burst through on the left before pulling the ball back for Lowe to score from six yards. City had goalkeeper John Danby to thank for maintaining that lead as he produced a fine one handed save to tip over a James Ryan free-kick just before the interval. City doubled their lead on the hour mark when Anthony Barry was a adjudged to have been tripped in the box and Lowe sent Ian Dunblavin the wrong way from the resulting spot kick. The nearest the visitors came to pulling a goal back was on 75 minutes when Danby, diving at full length, just managed to fingertip a powerful effort from John Miles onto the post and out for a corner. After picking up his fifth booking of the season at Valley Parade, midfielder Damien Mozika will miss Sunday’s trip to Macclesfield Town with a one match suspension. City manager Mark Wright was happy to see his side complete a second successive clean sheet to prevent hosts Bradford City from scoring at home for the first time this season. In front of a crowd of just over 12,000, John Danby made three great saves, the last in added time, to deny the Bantams the three points that would have lifted them to second place in League Two. The Blues have steadied the ship in recent weeks having picked up seven points from the last twelve. On Boxing Day they will be looking to continue their run when they entertain Accrington Stanley at Deva Stadium. Stanley lie a place below City, with a game in hand, following their 3-1 home defeat against Rotherham United on Saturday. Goals from Ben Jones and Chris Newman gave the youth team a 2-1 victory at Blackpool today. JOHNSON BACK AT THE VALLEY? City are hoping to have Eddie Johnson fit again for tomorrow’s League Two clash at his former club Bradford City. The Chester born forward has missed the last four games though a hamstring injury but manager Mark Wright is hopeful of a return to Valley Parade for Johnson tomorrow. The Blues have been short of an attacking option for much of the season with Paul McManus the only other recognised striker available. The hosts are in fifth place and pushing for promotion. A crowd of 13,000+ is expected tomorrow as they look to put last weeks 2-1 defeat at fellow promotion chasers Brentford behind them. City met the Bantams three times last season, including an FA Cup first round clash, losing by a single goal on each occasion. Both David Mannix (left) and Tony Dinning have been told they don’t feature in manager Mark Wright’s plans and must find new clubs in January. And Wright has indicated that other players may also be surplus to requirements and offloaded. Mannix has only made two appearances since he wa signed fom Accrington Stanley in June and is currently recovering from an alleged training ground attack that left him with a facial injury. 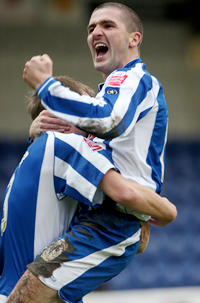 Dinning was signed from Stockport County in October 2007 but has only made two appearances this season. In the second of those at Bournemouth earlier in the month he was red carded and is currently serving a three match ban. Goals either side of the break from Ryan Lowe and Kevin Roberts brought City’s second victory in three games on Saturday when they overcame Notts County at Deva Stadium. This was the first home win since the return of Mark Wright for his third sting at Chester. Both Kevin Ellison and Jay Harris returned to the starting X1 with midfielder Damien Mozika making an appearance from the substitutes bench as the Blues recorded only the second clean sheet of the season. Both Kevin Ellison (left) and Jay Harris will be available for selection tomorrow after serving out suspensions. Midfielder Damien Mozika also appears to have fully recovered from his injury and could well be in contention for a recall as well. The Blues entertain Notts County at Deva Stadium, kick-off 15:00hrs. The Magpies suffered a surprise FA Cup knockout in the week at the hands of Kettering Town losing away 2-1 in their second round replay. City will be without the suspended Tony Dinning as well as the injured Paul Butler, Eddie Johnson and Stephen Vaughan. County manager Ian McParland will be looking to his side to bounce back from the midweek defeat but will be without the injured trio Adam Tann, Richard Butcher and Nat Wedderburn. The Magpies currently lie 15th in League Two with six more points than the Blues. Like City they have won just twice on their travels so far this season, they also shipped six goals at Dagenham last month, a defeat that came a week after a 4-0 victory at Barnet. Their other away victory came at Port Vale. 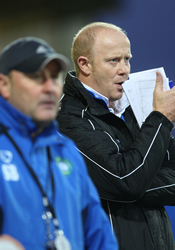 Simon Davies has returned to the football club as Youth Team manager. Davies held a similar position before moving up to manage the first team in March 2008. He was sacked last month following a series of poor results to be replaced by Mark Wright. City owner Steve Vaughan said: “Unfortunately it didn’t work out for Simon when he was in charge of the first team, but he functioned extremely well when he was overseeing the young set-up at the club. The club have announced a half season ticket offer that comes into effect at the Boxing Day match against Accrington Stanley. Supporters can benefit by buying tickets for the remaining 13 matches at the price of 11. Tickets for the East and West Stands are available for £165.00, concessions and juniors can purchase tickets for £110.00. Tickets will be available from the offices at Deva Stadium from Friday. A goal two minutes from time by Darren Anderton was enought to condemn City to defeat in their south coast match at Bournemouth. Anderton, a second half substitute for the Cherries, was playing in his last match and had earlier come close to opening the scoring when he fired a 25 yard free kick inches wide of John Danby’s right hand post. The Blues had their chances in a scrappy game but they were few and far between. Ryan Lowe asw a flicked effort go just wide following good work by Laurence Wilson and both Mark Hughes and Shaun Kelly saw headers creep agonisingly wide. Midfielder Tony Dinning, making only his second appearance of the season, was given a straight red card eight minutes from time after referee James Linnington had adjudged that he’d elbowed Danny Hollands after a tussle for the ball. The Blues face Notts County on Saturday and should have both Kevin Ellison and Jay Harris available after suspension. Tony Dinning has received a three match ban following his red card at Bournemouth on Saturday. He will miss the games against Notts County, Bradford City and Accrington Stanley. Chester travel to the south coast this weekend when they play 23rd placed Bournemouth, kick-off 15:00hrs. The Blues will be looking for three more points away from home to add to those gleaned at Darlington in their last match. City will be without the suspended Kevin Ellison and Jay Harris for the trip to Dorset but manager Mark Wright hopes to include midfielders Damien Mozika and Tony Dinning (left) in the squad. The Cherries have amassed 17 points this season, one more that City, and have now wiped out the points penalty imposed on them at the start of the season and they now site ten points behind Grimsby Town in the place above. Saturday marks the last game in an 18-year career for the former England international Darren Anderton who retires after the match. Anderton, 36, will play his 569th and final match on Saturday after a long career that’s also seen him play 30 times for his country. Prospective club owner John Batchelor may attend tonight’s supporters meeting in Chester after having talks with Blues owner Steve Vaughan. Batchelor has confirmed that should he takeover then the name of the club would change. This would obviously not go down well with the supporters, neither did it with those of Mansfield Town when he was looking to take control there and suggested the same scheme at Field Mill. A supporters meeting has been called for Wednesday night in Chester to discuss the future of the club following the announcement from owner Steve Vaughan last week that the club was up for sale. Concerned supporter Kevin Wilding has organised the event at the Deva Showbar in City Road (just along from the station) with a 19:30hrs start. All supporters are invited to attend and it is hoped that Vaughan will himself be present. Midfielder Jay Harris has received a one match ban after picking up his fifth yellow card of the season at Darlington. He will now sit out the trip to Bournemouth on Saturday.